Updating a 15-year-old messaging system took a back seat to the year 2000 transition, but the Forest Service managed both feats during the agency's peak business time'forest fire season. Joan B. Golden, deputy director of information resources management staff, said it took about five months to push through the e-mail change, starting right after Jan. 1, 2000. 'It was a huge transition' from 300 Data General Corp. mail servers to just 10 multiprocessor IBM RS/6000 F50 servers running Lotus Domino Mail Server under AIX, she said. Each server cluster has a 200G RAID Level 5 storage array. 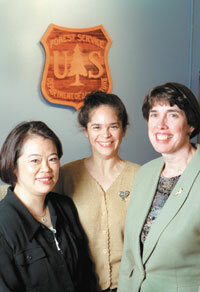 Fukomoyo, Deborah Hare and Joan Golden tried out the features of Lotus Notes before rolling it out to Forest Service users. Eventually, she said, the Forest Service might set up the servers for one-place lookup of personnel in regional offices, research stations and forest posts. Disk storage upgrades were necessary for some of the agency's 32,000 PC clients, acquired in 1998 as updates to the X terminals as the standard Forest Service desktop under Project 615 [GCN, July 28, 1997, Page 1]. The clients run Lotus Notes client software and Microsoft Office 2000 Professional. Notes Release 5 alone requires 70M of storage. The collaborators work in so-called team rooms, which notify everyone by e-mail when a document is posted, and in document databases, which let one person clip and post items to someone else without faxing. Discussion databases permit users to talk back and forth and maintain calendars. The IRM staff tried out these features during the implementation of the new mail system. 'We learned by using. Everyone tried things and formed subteams,' Golden said. Mobile workers got Notes R5 on their portable computers to replicate their various databases and e-mail messages for reading offline and resynchronizing later. Before the Notes team rooms were available, Forest Service officials would make decisions about the agency's conservation grant applications by distributing proposals via fax and overnight delivery, then traveling to a hotel meeting to make selections. Now they post the proposals and Microsoft PowerPoint presentations in a team room and rank them via teleconference. Two add-ons that the IRM staff developed in-house now handle time and attendance reporting and travel vouchers. 'We worked with Notes to make them work with the new e-mail,' she said.